Antivirus software and firewalls play valuable roles in protecting your system. However they cannot protect your computer from hackers and worms that use buffer overflow security holes in Windows to infiltrate into the system. Once your computer is under hackers? control, they will turn your day into a nightmare. In a few seconds they can stealthily copy your documents, passwords, credit card numbers or run a malicious application. 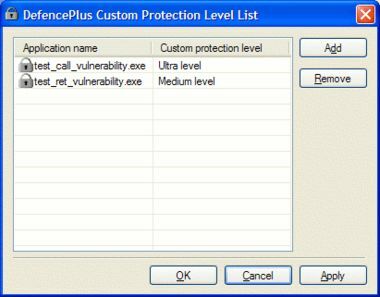 DefencePlus offers what traditional antiviruses and firewalls miss - a real-time anti-hacking protection. It is specifically designed to eliminate stack- and heap-based buffer overflow vulnerabilities, traditionally exploited by hackers. The program silently runs in the background, watching for hacker and worm assaults and blocks any intrusion-like process from the outset before it compromises the integrity of your system. As distinct from its competitors, DefencePlus protects your entire system, including the operating system, its components and all software installed on your computer. Four security levels are available - low, medium, high and ultra. By specifying the security level for each application individually, you can achieve a full compatibility of DefencePlus with your system and minimize the number of misoperations. With DefencePlus you will no longer fear that any unscrupulous parasite can read your emails, modify your system settings, or infect your computer with a virus. Thanks to the minimal resource utilization, the program doesn?t hinder computer performance. And by using DefencePlus with a good antivirus product and a firewall, you get the unyielding three-layer protection system against all kinds of security threats.